viaLibri ~ Signed Hand-Drafted Cheque. 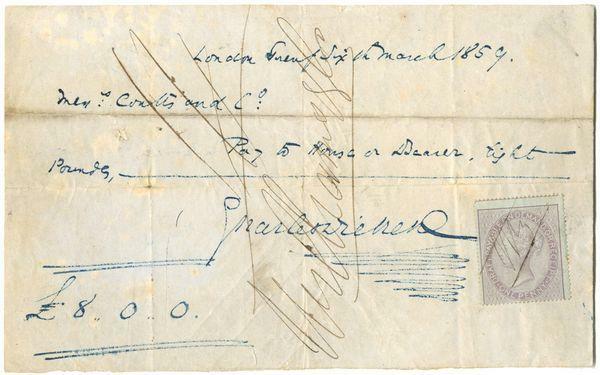 For eight pounds, payable ?to House or Bearer?, dated London 26th March 1859 and signed with a characteristic flourish. Signed Hand-Drafted Cheque. For eight pounds, payable ?to House or Bearer?, dated London 26th March 1859 and signed with a characteristic flourish. 1859 1859 - Folded into eight, with sl. browning along creases. One tiny hole. Overall a nice clean example. An unusual cheque, drafted by Dickens in blue ink on a piece of paper, 18.5 x 11.5cm, presumably after he had run out of printed cheques. It is countersigned in black ink by Williams & Co., and bears a one penny stamp, crossed through, legitimising the payment. There is no record of the transaction in Pilgrim Letters, but as the cheque has no named beneficiary other than ?house or bearer?, it seems likely that it was for household expenses, and would have been entrusted to a member of the domestic staff. A note on the verso, signed by John Holt Schooling, March 1st 1894, states, ?this cheque . was given to me by Georgina Hogarth.? There is a further contemp. signature, ?Bishop? (possibly the cashier? ), and an addition in manuscript. PLEASE NOTE: For customers within the UK and the EU, this item is subject to VAT.